provides a beautifully decorated setting for your organization's cocktail reception, luncheon, brunch, etc. Our spaces and staff offer a warm, festive environment for small and large groups. With ample parking and affordable pricing, your holiday wishes can come true early! For more information or to book contact Clara Callahan, Conference Center Director. You can also call at: 202-635-7987 (ext.12). For Christian-based groups, Chapel Hall provides a seasonally festive space for an Advent prayer service to accompany your celebration, as well. can help your organization meet its holiday and year-end needs. 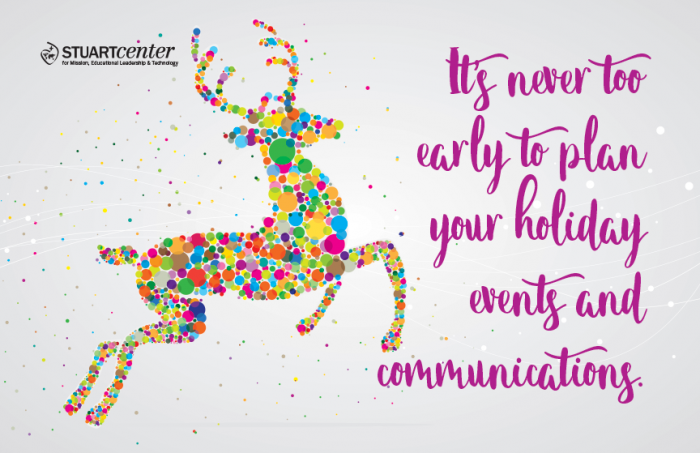 CEDC's graphic design department can create your custom holiday greeting in digital and/or print formats. Let us also help you with your end-of-year appeal mailers, e-blasts, social media postings, annual reports and much more. We can even help optimize your online donation page to maximize year-end giving. Whether print or electronic format, CEDC's graphic design department is ready to help. Please contact our award-winning designer, Beth Ponticello, for more information and free quotes.